WASHINGTON — Nutveena Sirirojnananont is staring at a possible 20 years in prison and a $1 million fine for ordering eight guns online that she directed to a federally-licensed firearms dealer in New Hampshire, but she’s all but guaranteed a fraction of that. The Newmarket, NH, woman pleaded guilty in January to purchasing the weapons from Suds and Soda Sports, a licensed gun dealer in Greenland, NH, and using intermediaries to ship the weapons to associates in California, Florida and New York, who then shipped them to Thailand. Sirirojnananont pocketed a 15 percent markup on the guns, which she sold through her online beauty-supply export business, cheapshop4you.com, in Portsmouth, and through an EBAY business called the PookyWookyShop. Sentencing is set for May 5. The prospect of a light sentence isn’t unusual. In fact, it’s more the rule than the exception in gun trafficking cases around the country, a point that frustrates the top gun enforcement agency, ATF, to no end. The chief problem, ATF officials say, is that there is no comprehensive federal statute in place that expressly outlaws gun trafficking and so-called “straw purchases” in which third parties buy weapons for people, often affiliated with crime organizations. Instead, ATF says it’s forced to rely on “paperwork” violations such as making a false statement on the forms required to purchase a gun from a licensed dealer. 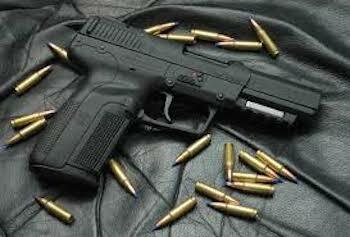 Consequently, there are cases all around the country in which people get off light for gun trafficking. Some even get probation. Such is the case of Neil Smith, of Little Rock, AR, who got off last year with felony probation after ATF agents purchased seven firearms from him. Smith later admitted to illegally selling between 50 and 100 guns for profit. In St. Paul, MN, Paul De La Rosa, who purchased over 119 firearms that he trafficked to Mexico, allegedly to a drug cartel, received just 36 months in prison. And then there’s the more highly publicized case of Denver woman Stevie Vigil, who in March was sentenced to less than three years in prison, after pleading guilty to buying and transferring a firearm to a convicted felon and prison gang member who used the gun to murder Colorado Department of Corrections Executive Director Tom Clements at his home, and a Dominos pizza delivery man named Nathan Leon. The statistics for gun crimes is sobering. According to the Justice Department and White House, 90 percent of the guns traced to crimes, the criminal was not the original purchaser. One out of every three guns used in a crime has crossed state lines, Graden says. From 2004 to 2010, over 33 percent of the individuals convicted under the so-called “paperwork” violations received no prison sentence. An additional 33 percent received a prison sentence of less than two years. “These punishments are frequently too low to serve as meaningful deterrents and are not proportional to the seriousness of the crimes,” Graden says. ATF’s highest priority is reducing violent crime, he says, and a good number of violent crimes involve efforts to move firearms to people who are prohibited by law from owning them. Graden says ATF is cracking down on gun crimes by inspecting licensed gun dealers, targeting and arresting straw purchasers, and improving intelligence to identify and target individuals engaged in firearms trafficking operations in the U.S.
A bipartisan gun bill in the U.S. Senate last year, sponsored by Sen. Patrick Leahy, (D-Vt.) and Susan Collins (R-Maine), included straw purchasing and gun trafficking prohibitions. A substitute proposal by the National Rifle Association, however, stripped the straw purchasing component, which would have made it a crime, punishable by up to 15 years in prison, to purchase a gun for another person through a gun dealer. The NRA also proposed that for gun trafficking to be illegal, a purchaser would need to have actual knowledge — as opposed to a reasonable expectation — that a third party intended to use it for illegal purposes. The bill, which included a number of other proposals, fell two votes shy of a super-majority needed to pass through the Senate. Sen. Leahy’s office said it has no new updates to report. In January, the U.S. Supreme Court heard a challenge to straw purchase provisions found in the Gun Control Act of 1968 and the Brady Handgun Violence Prevention Act signed by President Bill Clinton in 1994. As the high court reviews the case, the ATF insists that without an explicit gun trafficking statute that outlaws the purchase and illegal sale of weapons, including straw purchases of guns for other buyers, the government has little leverage to build cases that involve larger criminal schemes. Currently, there are two primary statutes at the ATF’s and the Justice Department’s disposal. Title 18 of the U.S. Code, section 922(a)(6) prohibits false statements by any person made “in connection with the acquisition or attempted acquisition of any firearm or ammunition from a licensed importer, licensed manufacturer, licensed dealer, or licensed collector,” with the intent of deceiving such sellers with respect to the subsequent sale or disposition of the firearm. This is known as the “lying and buying” law. A second statute, Title 18, section 922(a)(1)(A), which targets unlicensed firearms dealers, prohibits “importing, manufacturing, or dealing in firearms” without an appropriate license. Eric Epstein of ATF’s Office of Chief Counsel, talks about the inadequacy of the laws. As a result, cartels and other criminal organizations can coerce or threaten buyers or their relatives into accepting a relatively low penalty that provides little incentive to cooperate with authorities, according to the ATF. Accomplice and conspiracy statutes provide law enforcers with some recourse, he adds, but those laws require knowledge of the way in which the gun is going to be used. Thus cases like Nutveena Sirirojnananont continue to vex the ATF. In 2011, Special Agent Daniel Futrell was looking at multiple sales reports and saw that Sirirojnananont had bought a cache of weapons from Suds ‘n Soda, after having ordered them from an online dealer to be delivered there. Under federal law she was required to complete an ATF form for each weapon, 11 in all, including eight handguns and three semi-automatic weapons with lower receivers. When confronted by the ATF, Sirirojnananont confessed to lying on the forms and said she was buying the guns not for herself but for two men she knew. She told the agents that one of the men contacted her in 2010 with information about the guns he wanted and wired money to her bank in Thailand. After withdrawing the money, she deposited it in a separate bank account, then purchased and transferred the guns to the men in metal boxes with combinations that she bought on Amazon.com. Sirirojnananont also took an additional 5 percent fee for purchasing ammunition. American-made guns are popular but expensive in Thailand, which prohibits people under 20 from owning a gun and requires strict background checks for a gun license. But even though Sirirojnananont pleaded guilty to conspiracy to evade existing U.S. laws, her crimes were limited to arms exporting and false statements in connection with a firearm purchase and unlicensed firearms dealing. Which limits what the government can do to leverage her cooperation in expanding its investigation, or to mete punishment in a meaningful way that deters others. Posted: 3/31/14 at 9:28 AM under News Story. ATF’s biggest problem is its top management, e.g Assistant Director Bill McMahon and cronies. A fish rots from the head.